What if certain orders need to be excluded from billing attribution? There are certain types of orders that you may want to be excluded from order attribution for billing. High volume regular customers, such as wholesalers, that you don't feel should be receiving triggered email, or internal team members are two examples of these types of orders, but there may be others. There are two ways to exclude specific customers from being emailed and/or included in order attribution. 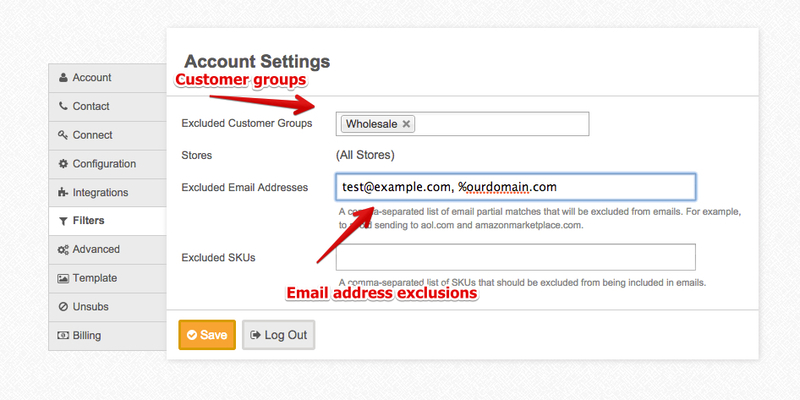 You can exclude entire customer groups from receiving any MageMail email. And the other thing you can do is exclude specific email addresses or partial email addresses. If you feel like orders that you've already been billed for should be excluded, just reply back to your billing email and we'll take care of it for you. For orders in the current month that have not yet been billed yet, you can exclude them yourself by adding the customer emails to the exclusion list. You cannot exclude them by adding their customer groups to the exclusion list.